When that scary, dramatic dark and cloudy overcast that threatens rain can be seen from a distance. The out of order sign placed on the elevator door. That creepy walk up a lonely flight of steps with a half drunk girlfriend who falls and breaks a nail. Just when the sun hides behind a mysterious clouds which seem to have come out of nowhere just before the moon is seen peeking through. You know the feeling. When the cool breeze that’s felt, just before the storm, as the ragging wind blow dead leaves forming a spiraling circle resembling an oncoming tornado. That thick and hot muggy feeling one experience after the storm is felt as the window suddenly opens by itself. The strange sounds heard of someone walking. The frightful moan expressed out of fear while jumping under the covers thinking someone is inside the house. The abnormal chest to mouth heart pounding experience that triggers an uncontrollable anxiety to seek better shelter can be felt, producing additional fear of the unknown. Luckily a police cruiser was parked outside across the street from the building. After the lightening struck things had gotten a little strange and out of control. There’s no signal for the phone. The sudden rapid flickering of the lights just before the power goes out. The broken grey cover of a kill switch box located in the basement needed to be fixed. 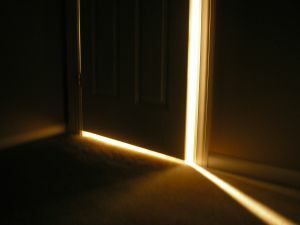 The shadow of a stranger seen moving back and forth from under the door brought about the symptom of an upset stomach. The feverish and frantic turning of the handle of a locked bedroom door encourage it to bubble as the entire unit shakes from the storms vibration. The crackling of thunder as darkness settles in and hovers. How daylight turns to night. In a snap of a finger and in that very instant Mommy bust into the room asking, “Why is the volume up sooo loud? You should be asleep. I wish you would abide by my rules, Princess. I don’t want you to go deaf and have nightmares. Ok?” She turns off the television and warns her daughter again of what will happen if doesn’t listen to her advice, killing the mood and the excitement. She thinks to herself, “Damn, I can’t wait to get my own place”.